NOMID/CINCA has the highest severity of chronic inflammation of all the forms of CAPS. NOMID is the commonly used acronym for: Neonatal Onset Multisystem Inflammatory disease. This syndrome is also known in Europe as CINCA, which is the acronym for: Chronic Infantile Neurological, Cutaneous and Articular Syndrome. Muckle-Wells Syndrome (MWS) and Familial Cold Auto Inflammatory Syndrome (FCAS/FCU) are the other slightly more common, but less severe forms of CAPS that have been found to have mutations in the same genetic region of the NLRP3 (CIAS1) gene. NOMID/CINCA patients have inflammation present through most of their body, and can sustain some permanent damage, but the prognosis is greatly improved if early diagnosis and treatment with beneficial medications is started early in life. Before these targeted medications were developed for CAPS, it was estimated that 20% of children with the NOMID/CINCA form of CAPS would die before they reached adulthood. Currently the prognosis for most patients with NOMID/CINCA is very good and most patients are surviving into adulthood if they are on these new medications. Earlier diagnosis and medication treatment may greatly improve the quality of life, reduce damage to the body from chronic inflammation and prevent severe complications or premature death in NOMID/CINCA, but more research is needed. Most NOMID/CINCA infants have a maculopapular skin rash. 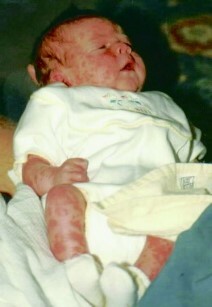 The rash appears shortly after birth, or within the first few days or weeks of life. The rash generally resembles hives, varies in intensity from day-to-day, and can increase dramatically during times of increased flare-ups of inflammation throughout the body. Generally the rash is not irritating, but there are some patients that complain that it is itchy. There are some common skin biopsy findings related to this syndrome, such as an increased number of neutrophils at the eccrine coils. Articular (joint) affects are present in variable degrees in most patients with NOMID/ CINCA. Periodic swelling without damage between flare-ups of inflammation are generally present. There can also be disfiguring and uncontrolled anomalous changes to the growth cartilage, often at the knees, suggestive of a pseudo-tumor growth. Many people that have developed this have enormously enlarged kneecaps (patellas) and other bony overgrowth at the large joints. This can occur in approximately 50% of people with NOMID. Often, biopsy findings show disorganized cartilage with no inflammatory cells present. 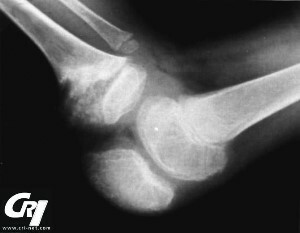 In the past, physicians thought that the enlarged, bony overgrowth was a necessary characteristic in order to diagnose someone with NOMID/CINCA, but now it is known that not all people with this syndrome develop the irreversible, disfiguring and debilitating damage to the joints. There is a great degree of variance in inflammation, deformity and pain in the joints with NOMID/CINCA. Often, many patients have other musculoskeletal problems, including decreased muscle tone, lax muscles, knee valgus or varus, and may even the need for orthotic devices to assist or correct problems. Some patients are unable to walk or bear weight on their legs due to joint damage, and/or pain. Central Nervous System (CNS=Brain, spinal cord, and nervous system) involvement, and damage is common in varying degrees of severity in almost all patients with this NOMID/CINCA. In the past, it was believed that you must show profound CNS involvement to have a diagnosis of NOMID/CINCA, but there are a few patients that may present with extremely mild CNS involvement, or periodic CNS inflammation that may be difficult to detect at times. A lucky few do not develop permanent damage despite having some level of chronic CNS inflammation. However, these concerning symptoms can develop at any time in the patient's life, and should be assessed regularly. CNS inflammation is one of the most debilitating symptoms of NOMID/CINCA, and there can be a great degree of variance between patients complaints. CNS symptoms may include: Headaches, neck and/or spinal pain, nausea and vomiting while having other CNS symptoms, elevated spinal fluid pressures (sometimes requiring shunts to relieve the pressure), vision changes, light sensitivity, chronic aseptic meningitis (non-infectious brain inflammation) with elevated neutrophils, and occasionally eosinophils present in the cerebro-spinal (CSF) fluid. Some CAPS experts feel that the presence of signs of chronic aseptic meningitis and/or papilledema in patients is a determining factor in deciding whether a patient has NOMID/CINCA versus Muckle-Wells Syndrome (MWS), regardless of age. A few children with NOMID/CINCA have even suffered from strokes and epileptic seizures due to the CNS inflammation. The majority children with NOMID/CINCA have significant cognitive and mental deficits, and/or learning disabilities. However, there are a few that have been spared from any mental or cognitive effects, despite having notable CNS inflammation. CNS inflammation can also cause damage to vision and hearing in many people. Increased CNS symptoms can vary with the degree of inflammation in the body, and can intensify during flare-up episodes. Often, NOMID syndrome causes bouts of fevers (starting in infancy), accompanied by flare-ups of the rash, increased pain in the joints, headaches, red eyes and other symptoms. Some patients may also vomit repeatedly and have excessive thirst during flares, along with severe headaches, irritability and pain at the joints and spine. They have great discomfort during very frequent, almost daily flare-ups. The recurrent flares of inflammatory symptoms along with the recurrent fevers led to these syndromes being classified as periodic fever syndromes before the genetic origins were discovered. Flare episodes are very debilitating, and may even require medical assistance if they are severe. Often, these flare ups are misdiagnosed as bouts of illness or allergic reactions, until more symptoms develop over time. Parents note that the same flare behaviors are occurring often, and are not connected to any illness or allergic triggers, but it can be difficult to convince some doctors. Many families have found that having a daily symptom diary to share with the doctor has helped to facilitate diagnosis. NOMID/CINCA patients can be more symptomatic after exposure to cold or cooling temperatures, but often have frequent flares present regardless of the climate. It is difficult to note times when the patients are not showing signs of CAPS inflammation, especially the almost ever-present rash. Shortly after birth, and often during inflammatory flare-up episodes, many people with NOMID/CINCA and other forms of CAPS can suffer from conjunctivitis (reddened whites of the eye, NOT caused by infection). Progressive pressure in the brain, and chronic CNS inflammation in most NOMID/CINCA patients often causes varying degrees of chronic papilledema in the eyes (bulging out of the optic discs in the back of the eyes.) This can lead to a serious loss of vision in many cases of NOMID/CINCA. In some patients, inflammation can cause sudden, and potentially damaging conjunctivitis, iritis and uveitis. 50% of patients that develop uveitis do not respond to conventional treatment, and can have permanent damage to their vision. It is very important to have a complete opthalmology exam of the eyes in all patients with this syndrome, or those suspected of having it. For infants and children that are too uncooperative (due to age or developmental issues), an eye exam under anesthesia may help in the diagnosis and treatment of these patients. It is important to have a good view of the optic discs in the eye, and other features to evaluate for signs of inflammation. A few NOMID patients that have also been on corticosteroids have developed cataracts, but this is not commonly seen, and may be due to the high doses of corticosteroids. Progressive sensorineural deafness (often related to chronic pressure in the brain from constant inflammation) can occur in many children with NOMID/CINCA, so hearing tests need to be done by audiologists. MWS patients can also develop this kind of hearing loss, but it usually develops in later childhood or adolescence. The basic "pre-school hearing tests" will not usually catch the complex array of hearing problems early enough, but it may help to find those children with very profound hearing losses. Therefore, a full audiologic evaluation of any patient suspected of having NOMID, MWS or one of the other periodic syndromes should be mandatory. Hearing aids can help some patients, depending on the degree of hearing loss present. This is a video made by a patient with NOMID that hearing loss was one of the earliest symptoms, but doctors did not connect the rash, fevers, joint pain, eye redness and hearing loss together as part of one disease (NOMID) until she was a young adult. Laboratory tests often reveal signs of non-specific inflammatory markers, even shortly after birth, such as: elevated ESR (Erythrocyte Sedimentation Rate), high C-Reactive Protein (high sensitivity CRP test, or CRP test), Elevated serum AA (Amyloid, SAA - not easily tested at most facilities), anemia (low hematocrit, hemoglobin and microcytic anemia), High polynuclear leukocytes, and thrombocytes (on a Complete Blood Count of the White Blood Cells [WBC's]), and many other changes. Many other irregularities are often present, including variances in IgG, Ig A, IgM, but this is not an essential part of the diagnosis. No antibodies or immune deficiencies in lab findings have been noted. 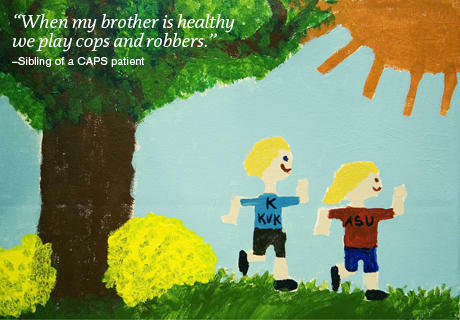 There is a genetic test for CAPS available, but there are a few patients with all the clinical symptoms and features of CAPS that do not have the NLRP3 gene mutation found with the basic genetic tests. Genetic testing is helpful, and should be done for all patients suspected to have CAPS, but should not be the only basis of diagnosis. As advances in genetics and the study of these syndromes continue over time, perhaps more genetic clues will come forward regarding these syndromes. There is a significant risk for Amyloidosis if prolonged buildup of serum AA is allowed to occur. Amyloidosis can develop in some patients after years of chronic inflammation with elevated serum amyloid, and some NOMID patients also have enlarged livers and spleens, regardless of serum amyloid levels. Please take a look at this chart of CAPS and other auto inflammatory symptoms for more information. Some patients with NOMID/CINCA have been found to have unique facial characteristics, such as a saddle back noses (scooped nose with very little nasal bridge between the eye area), or frontal bossing (rounded, protruding forehead) but these features are not present in all patients, and are NOT essential criteria for the diagnosis of CAPS patients. Some patients also have narrowed, smaller teeth and other dental anomalies. Currently, the best treatments found to help the many patients NOMID/CINCA have been the use of various Interleukin-1ß blocking, trapping or otherwise attacking drugs to prevent the cellular uptake of Interleukin-1ß in CAPS patients. Often, dramatic improvement is seen within days to weeks of starting these medications. In the US,anakinra (kineret) is the only medication that is FDA-approved for NOMID patients. In the EU, there are medications approved for all forms of CAPS, including NOMID that are beneficial. For more information, please go to the Treatments page.